Taken in Michigan's Eastern Upper Peninsula yesterday late afternoon. Snowshoe hares are mostly nocturnal, but at this time of year (breeding time) some individuals can remain out in the open, but close to evergreen forest cover. They are prey for a great variety of predators around here - foxes, coyotes, wolves, minks, large hawks and owls, ravens, crows. This individual should be praying that none of them are poised to make a sneak attack. Nice feel to this image, the melting snow and crisp light reminds me of our spring weather this weekend. This hare will be changing color soon. Excellent image of this important prey species! A very nice behaviour capture, Paul and so relaxed in its own little world. Sweet to watch when they do their cleaning and washing routine, especially when they do their ears right down to the tips with those furry front paw face cloths! Good title, it does look like a praying pose. Very cute! And well executed. You got it. It was doing its washing routine. Sweet capture- it does look like it's praying! Perfect environment-so nice it came out for you. I'l say a little prayer for it's survival too! 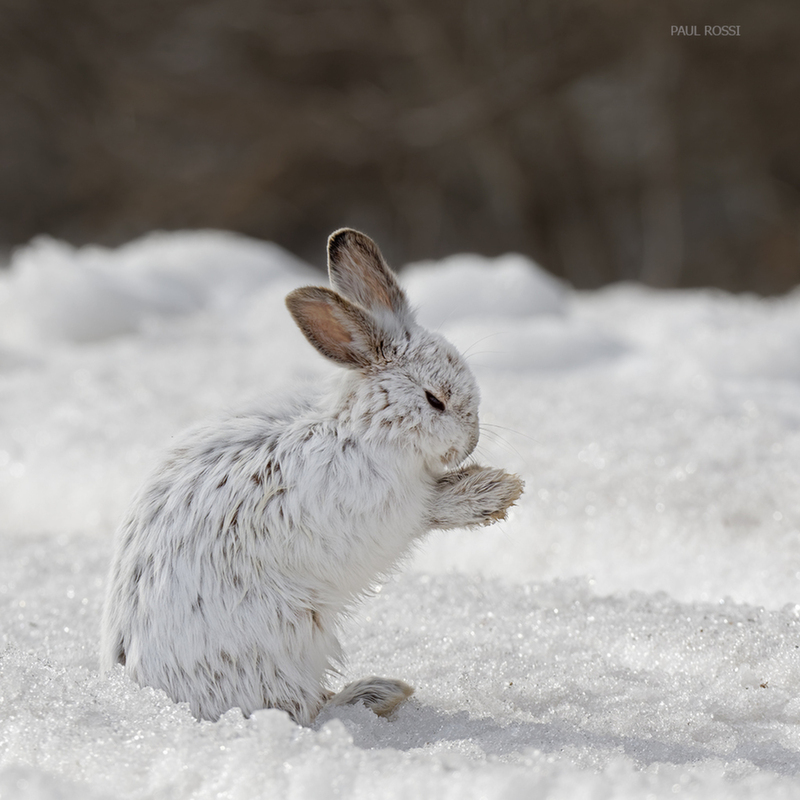 One of the best snowshoe hare images I've seen! Great timing.